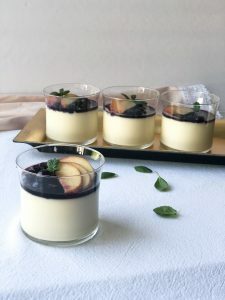 Panna Cotta is such an easy dessert to make and it is so tasty. Trust me, when i say that your dinner, lunch, brunch or breakfast guests will be impressed with this one. Prep ahead of time and serve whenever you want. All you need is a few ingredients and a little time; by little, I mean 15-20 minutes of prep and about 2 hours of resting in the fridge. 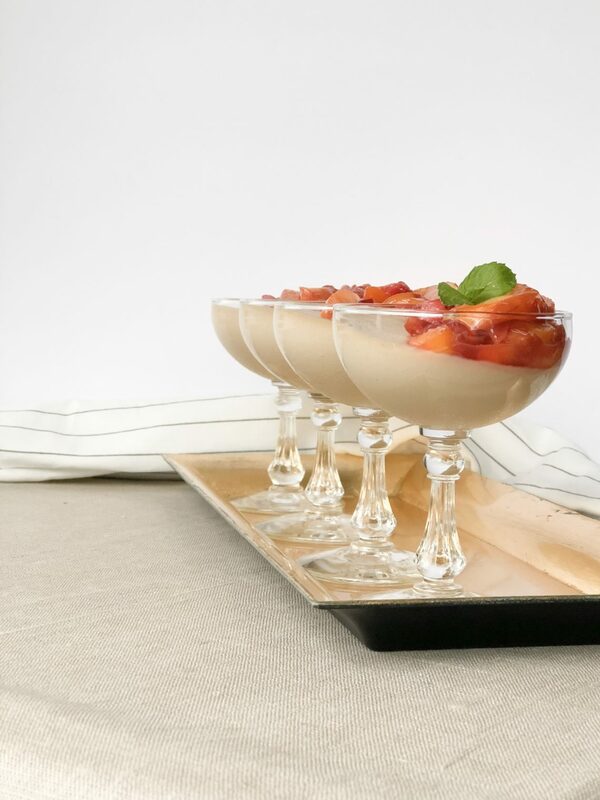 In a blink you for yourself a fancy dessert; Panna Cotta with Fruit Topping. There are many ways you could infuse this simple recipe with an array of flavors. I like it plain and I also like it with a twist. Here, I added Chocolate Peanut Butter Fudge that I had on hand from Marshal’s Mackinac Fudge. I added the fudge to the boiling base for a quick melt and flavor addition. So yummy. I topped it with a simple reduction of strawberries, peaches and a good sprinkle of sugar. In other words, saute the strawberries, peaches and sugar for about 5-7 minutes. 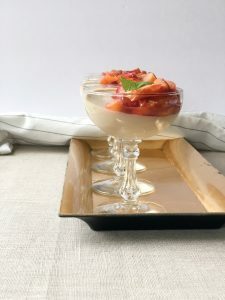 Panna Cotta is very similar to Creme Brulee in texture, except it is not made with eggs and it does not require any baking. 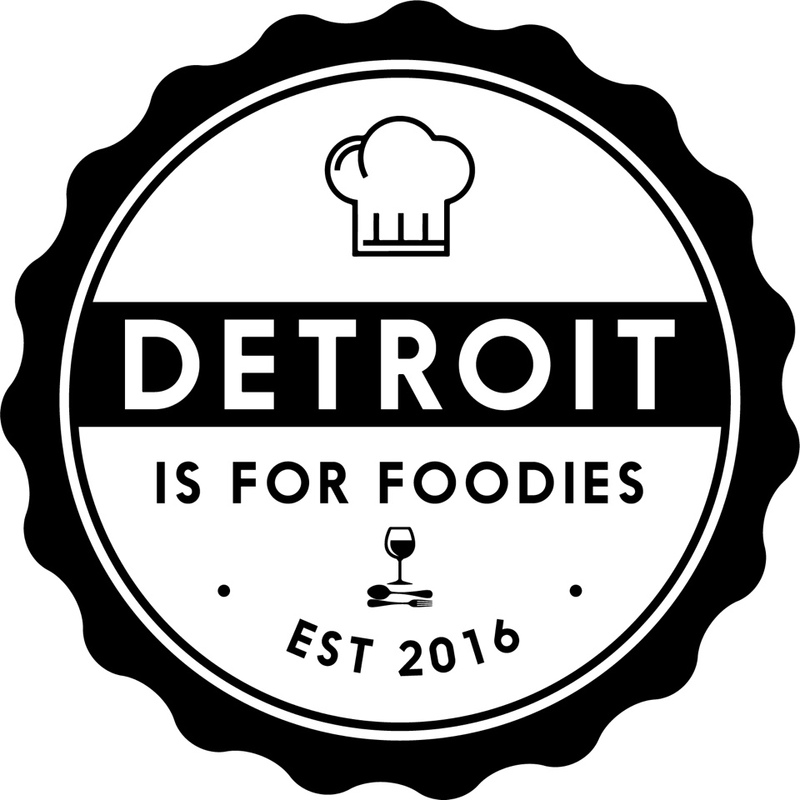 Instead, it’s made with gelatin. Thus making this a perfect Spring and Summer dessert. I mean, who wants to turn on their oven when it’s so hot out?? Not me! In the photo above, I kept the original flavor from the recipe below, and simply topped it with a blueberry reduction and freshly sliced peaches. Give this tasty treat a try! As always, I welcome your feedback and thank you for stopping by. In a small sauce pan on low heat, bring the heavy cream, sugar and vanilla to a slow boil. (Infuse here with desired flavors – see note below). Pour the milk in a shallow bowl, and sprinkle the gelatin evenly on top. Let stand for 5-7 minutes. Once the heavy cream mixture is at a boil, add the gelatin mixture to it and whisk really well until smooth, then remove from the heat. Divide the liquid into 4-6 glass serving containers. NOTE: I added Chocolate Peanut Butter fudge to the heavy cream, sugar and vanilla mix. Also try with lemon zest, instant coffee, and other fruit flavors. Add 1-2 tablespoons of flavor if desired. Good for 3-5 days if stored in the refrigerator.